Nitro-Carburized Rod: For exceptional corrosion resistance and durability. Durable Plastic Rod Guide: Durable Plastic Rod Guide reduces potential rod abrasion. Millions of vehicle owners rely on gas charged lift supports to lift and hold open trunks, hatches, hoods, and even glove boxes. When these fail, they must be replaced to restore convenience and safety. 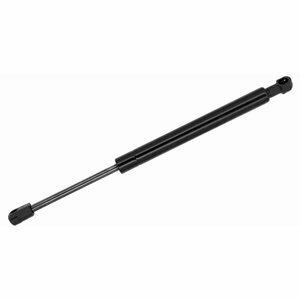 Max-Lift gas charged lift supports are engineered to fit and perform as well as the original units. Main Seal: Main seal provides positive closure for high-pressure gas. Stop Collar: Stop Collar and Limiting Groove assure precise extended length. High-Strength Piston Assembly: High-Strength Piston Assembly with leak-resistant seal helps prevent fluid leakage around the piston. Steel Body Pressure Cylinder: Steel Body Pressure Cylinder is manufactured for durability and corrosion resistance.